Elissa is a lost world romance inspired by the archaeological site of Great Zimbabwe, which documents the fall of an African civilization owing to its corrupt religion. 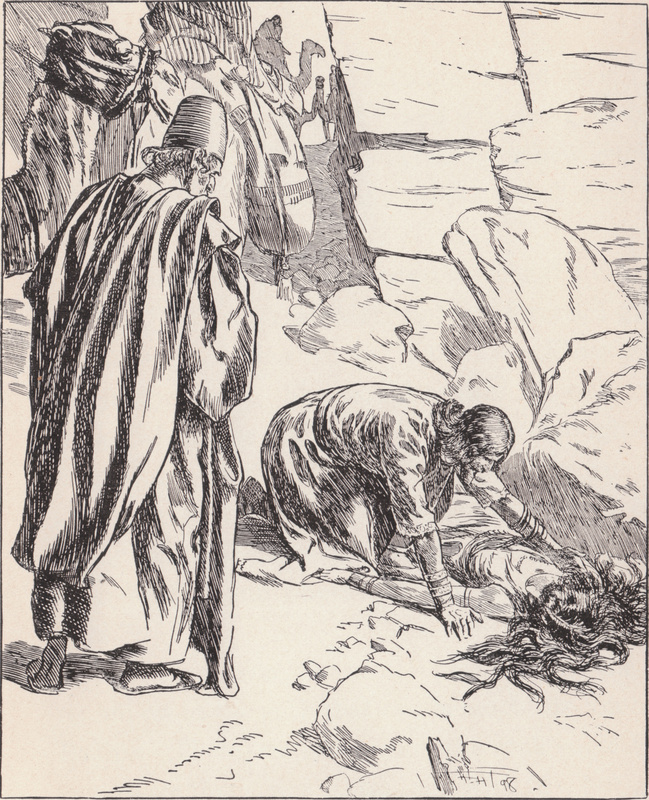 The Longbow deserves mention if only for the opportunity it afforded to F. H. Townsend to make some of his finest pen-illustrations for Rider Haggard' s story Elissa. Dignified, well drawn and distinguished, these were among the best work he ever did in this medium. Started on 2 February 1898, with a strong cover-design by Townsend, the paper expired on 16 November of the same year; and when the Haggard-Townsend collaboration finished on 8 June the paper showed very little reason for continuing longer (122). Elissa was frequently published with additional novellas by Haggard, including Black Heart and White Heart and The Wizard. After its initial serialization in The Longbow, Elissa appears in the Longmans, Green, London, book entitled Black Heart and White Heart and Other Stories, published on 20 May 1900. This Longmans edition includes a total of 34 illustrations by Charles Kerr and Townsend. This printing of Elissa includes 8 illustrations by Townsend (Kerr is responsible for the remaining 26 illustrations). Longmans printed 10,000 copies of this edition. A Longmans, Green, and Co., New York, edition published in 1900 titled Elissa, the Doom of Zimbabwe; Black Heart & White Heart, a Zulu Idyll omits TW. This edition also includes 8 of Townsend’s illustrations for Elissa, and 5 of Kerr’s illustrations for BHWH. Haggard, H. Rider. The Days of My Life, An Autobiography. 2 Vols. London: Longmans, Green and Co., 1926. Thorpe, James. English Illustration: The Nineties. New York: Hacker Art Books, 1975. Whatmore, D.E.. H Rider Haggard: A Bibliography. Westport, CT: Meckler Publishing Co., 1987. F20, 32-33; F23, 36-37. "Elissa; or, The Doom of Zimbabwe" from Black Heart and White Heart and Other Stories. London: Longmans, Green, and Co., 1900. "Elissa; or, The Doom of Zimbabwe" from Elissa; or, The Doom of Zimbabwe; Black Heart and White Heart. New York: Longmans, Green and Co., 1900.